Avoid spending too much money on marketing your business with 1-2-3 Power System… learn how this unemployed engineer discovered the secret of cheap ways to market any product or service. 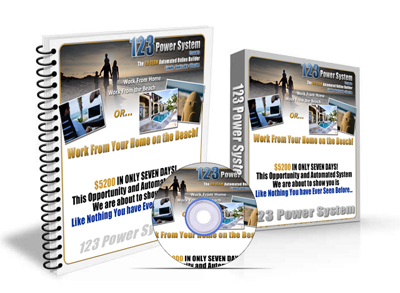 The 123 Power System marketing course was created to successfully market any product or service with little money. It contains an email marketing system, direct mail marketing system, classified ad system and a fax marketing system. Plumber, Heating & Cooling Specialists, Re-modelers, Lawn Service, etc. Heck, Any person that wants to put money in their wallet. How to write a high response Email ad. How to use Opt-in emailing services. How to quickly set-up an email broadcast. Direct Mail Marketing – How to make it work. How to generate a mailing list with No Money. How to make money with your mailing list. How to write a sales letter. How to address an envelope so it gets opened. How to test and track your results. How to save money on postage. How to get Free supplies and printing for your mailing. How to find the right mailing list to get started quickly. The two best methods for bringing in advertising customers. How to write Fax advertisement. How to quickly set-up a Fax broadcast with out a fax machine. How to write a successful Classified advertisement. How to target and place your Classified ads to bring in the sales. How to get checks by fax. Want a SNEAK PEEK before you buy? You Pick it! Get a Custom Video made just for you. Pick a topic from above. Type it in the custom video box below. Submit your name and email address. In less than 3 days you will get your custom sneak peek video. Your name and email is kept confidential. Business Tool Kit CD: contains Fax Software, email templates, phone script and more. No, the 1-2-3 Power System Marketing Course is not a MLM opportunity. Multi-level marketing (MLM) as defined by Wikipedia; is designed to create a marketing and sales force by compensating promoters of company products for sales they personally generate along with the sales of other promoters they introduce to the company, creating a downline of distributors and a hierarchy of multiple levels of compensation. The 1-2-3 Power System does not fit this definition. It only shows you how to promote MLM’s effectively. There is an opportunity for you to market and sale the 1-2-3 Power System Course yourself, but you will not be compensated from the sales of the person that bought this system from you. Therefore, a downline is not generated under you. You will learn how to avoid money making opportunity scams by evaluating opportunities to six criteria. So if you are thinking of starting a home based business to make some extra cash for vacations or to pay down your debt quicker. This is the place to start. In addition, when you purchase this book you have immediate resale rights as a distributer. You can sell this book for as much as $200. There are no guarantees, but I was able to recoup my cost in the second week. Yes, by law I can only speak of myself since I do not have the details of others. I used the email marketing system my first week. Sent an email based on one of the templates in the course to a list of 40 people and made a sale. Got a check for $200 the second week in the mail. Sent a check to the main warehouse and they shipped directly to the customer. The left over balance was mine to keep.